In his review of An Anxious Age: The Post-Protestant Ethic and the Spirit of America by Joseph Bottum, David Goldman agrees with the Bottum that "today's secular liberals are the direct descendants of the past century's Puritans and Protestants." good and evil not primarily in terms of personal behavior but as states of mind about the social condition. Sin, in other words, appears as a social fact, and the redeemed personality becomes confident of its own salvation by being aware of that fact. Note that salvation is achieved by "being aware of that fact" (and feeling bad about it), not doing anything constructive other than loudly protesting (forget about the beam in your own eye, the problem is the mote in the other guy's). Oh, and pinning scarlet letters on the sinners. Whether they know it or not, white women who practice belly dance are engaging in [cultural] appropriation. Frankly, were the author describing "cultural appropriation" done badly, I could have ginned up some sympathy for the argument. But judging from the comments, there comes a point at which the Inquisition has burned one witch too many, even in this sanctuary of self-righteousness. I certainly won't hesitate to saddle up my high horse when confronted with corny depictions of Japanese culture in U.S. media (and corny depictions of American culture in Japanese media). Though the proper human reaction, as Peter Payne confesses, is to laugh at it. Once I was watching an episode of Alias with my [Japanese] wife, and there was a horrid scene in which some female spy went to "Japan" (which appeared to be shot in a sushi restaurant about ten minutes from West Hollywood), painted her face white like a "geisha" and proceeded to extract information from her target despite not knowing his language. I was livid that in the 21st century TV producers couldn't even come close to getting basic imagery right, but my wife was enthralled with it, laughing at each new hilarious plot twist. And why not? After all, Japan has been "appropriating" foreign culture for the past two thousand years, beginning with Chinese religion, architecture, food, language (kanji), and political philosophy. 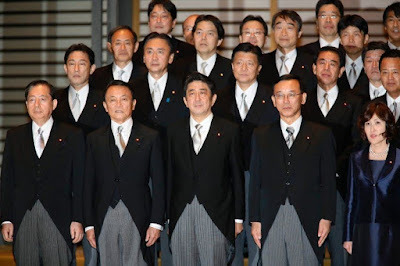 During the early Meiji period (1868-1912), while preaching "Western technology, Japanese spirit," Japan's ruling class went on a culture borrowing binge that earned it mockery from both Japanese conservatives and western commentators. And yet some things not only stuck but became deeply ingrained, like the waishatsu or white dress shirt. The English morning coat became the preferred formal wear for politicians. Western-style wedding gowns, along with the Christian ceremony, are becoming well-nigh ubiquitous. But getting back to dancing girls, one of Japan's most successful themed resorts is Spa Resort Hawaiians, started in an effort to save the local economy after the Joban coal mine in Northern Japan shut down. The story is dramatized in the cute movie Hula Girls (click to enlarge). In another cute kid's film, I Wish, the mom and grandma quite incidentally belong to the local hula dancing club (it has nothing to do with the plot). Over the past quarter-century, hula dancing has become a popular club activity for women in Japan. But turnabout is fair play too, and infotainment shows in Japan love featuring foreigners (the more "foreign" the better) who have embraced and even perfected some uniquely Japanese aspect of their culture. Such as Egyptian Abdelrahman Shalan (Oosuna-arashi), the first professional sumo wrestler from the African continent and a rising star. His wonderful sumo name is "Great Sandstorm" (大砂嵐). It's no surprise to any Japan watcher that he is immensely popular in Japan. 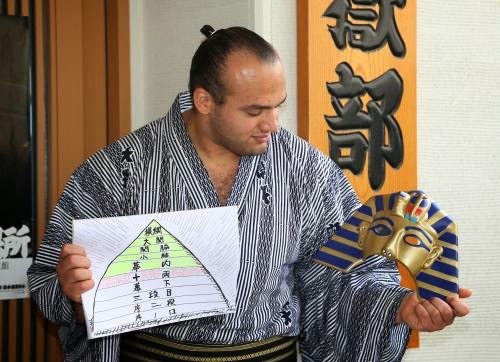 The "pyramid" illustrates the ranks in professional sumo. To be sure, the sport has become accustomed to non-Japanese sumo champions. Over the past decade (at six tournaments a year), only two championships went to native Japanese. One was won by an Estonian, one by a Bulgarian, and the rest by Mongolians. In response to your insightful comments--"Note that salvation is achieved by 'being aware of that fact' (and feeling bad about it), not doing anything constructive other than loudly protesting (forget about the beam in your own eye, the problem is the mote in the other guy's). Oh, and pinning scarlet letters on the sinners--I reposted my thoughts on this topic!